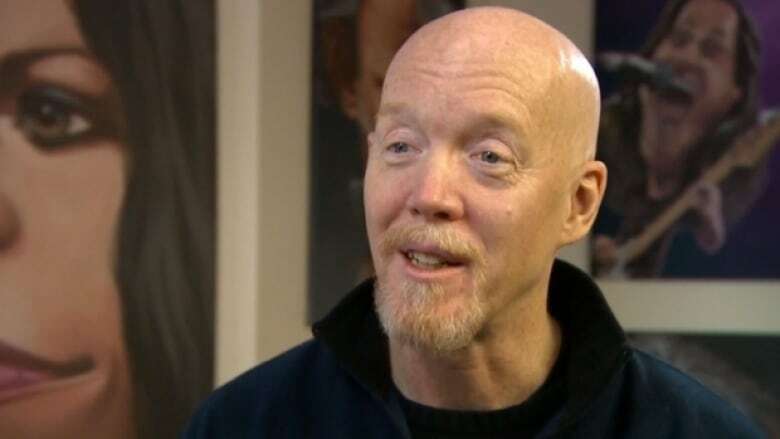 “I deal in symbols, and Lady Justice is a powerful one,” said editorial cartoonist Bruce MacKinnon. Last week, news outlets around the globe were tightly trained on a single event: the testimony of U.S. Supreme Court nominee Brett Kavanaugh, and of professor Christine Blasey Ford, who has accused Kavanaugh of a sexual assault at a high school party in the 1980s. Hundreds of editorial cartoonists have offered artful responses to the controversy, but a Halifax cartoonist's image has gone viral. An award-winning cartoonist for Nova Scotia's Chronicle Herald, Bruce McKinnon drew Lady Justice being pinned down and her mouth covered, echoing Ford's description of her assault, with the scales of justice strewn behind. The image is drawn from the attacker's perspective, with the Republican Party's elephant symbol on his shirt cuffs. The drawing has since been shared thousands of times, and has generated a wave of discussion online. The Washington Post published an article about the image and comedian and podcast legend Marc Maron tweeted it and posted it on Instagram, calling it "satire sharp as a knife" and generating tens of thousands of likes. Actress Alyssa Milano, who attended the hearings, also tweeted the image. Others have objected to the brutality of the drawing, saying it will trigger victims of sexual assault, and force them to relive the attacks they suffered. "I understand it's hard for people to look at, especially people who might be survivors of sexual assault," MacKinnon told CBC News. "For that reason though, I think a lot of people also agree that you can't turn off the conversation, pretend it didn't happen or look away." 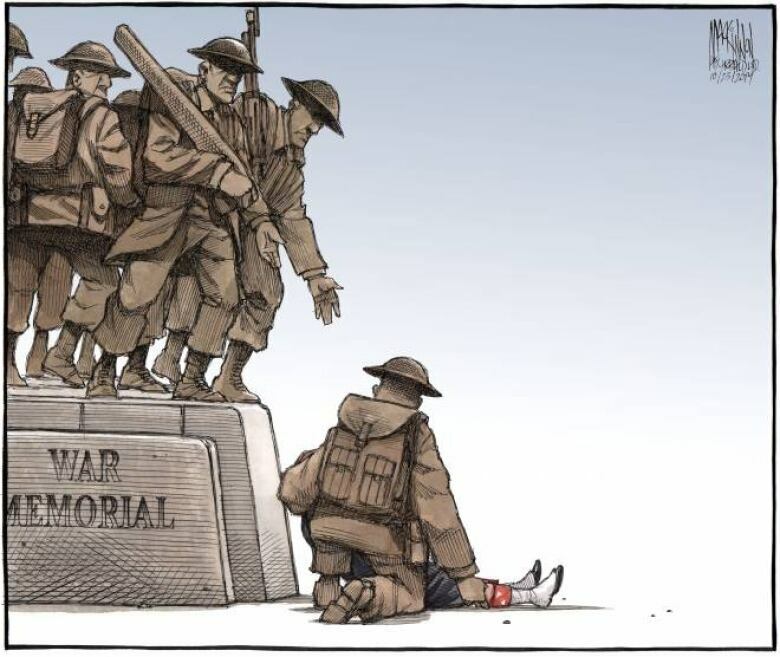 McKinnon is no stranger to viral fame; many of his images have been shared around the world after major moments in the news — including a particularly heart-wrenching drawing after Corporal Nathan Cirillo was shot and killed while guarding the National War Monument in Ottawa in 2014; another depicted Uncle Sam protecting the National Rifle Association after a school shooting. 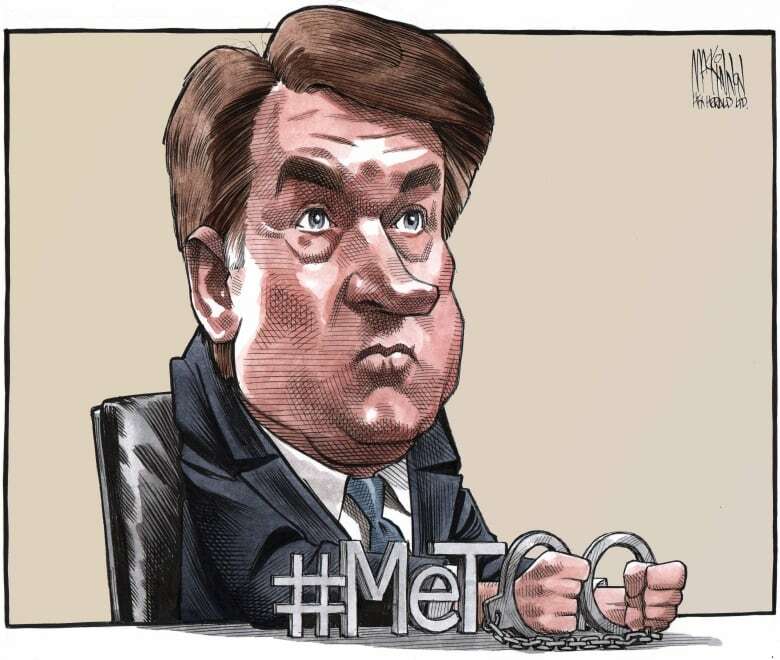 More recently, MacKinnon also drew a cartoon depicting Kavanaugh in handcuffs — but the cuffs are made from the "oo" in #MeToo. Earlier this year, a different Canadian cartoonist's work also went viral for her depiction of a major U.S. story: after the tragic school shooting in Parkland, Florida, B.C. artist Pia Guerra drew the school's beloved football coach, who was reportedly killed while protecting kids, being led into heaven. MacKinnon says he appreciates the attention the Lady Justice image is getting, because it means his work is having an impact. "And that's all you can hope for as a cartoonist — to underscore the importance of the decision to allow someone who is going to be making decisions on the highest court of the land, to have that shadow hanging over his or her past. I think that's a pretty weighty decision," he said. "A shocking image is probably the only way to be effective."